I remember an episode of Friends when Joey invited his friends over to his family’s house for dinner and Tiramisu was served for dessert; my love for Tiramisu started that day without even tasting it yet, I just know that I’m going to fall for it. ♥ 🙂 It has become my absolute favorite dessert which I only make on very special days. The not-too-sweet, melt-in-your-mouth lightness of creamy zabaglione-Mascarpone filling blended with the coffee-soaked Savoairdi cookies and bittersweet taste of cocoa and chocolate is sooo heavenly; really, really good.. “better-than-s**-good…uhmm, okay maybe not, but it gives you the same feeling of happiness… that’s why it’s called Tiramisu- it’ll lift you up! Tiramisu is an Italian dessert which means pick-me up or make me happy…with the chocolates and cocoa, the caffeine from coffee plus the alcohol in Marsala or rum, it will surely do- which makes Tiramisu not kid-friendly but you can skip or lessen the Marsala or liqueur in the coffee mixture if you’re planning to give it to kids, too. Tiramisu means lift me up. This heavenly Italian dessert is worth your time making. Combine coffee, sugar and liqueur/rum and chill it in the fridge while preparing the filling. Beat egg yolks, Marsala, and ¼ cup sugar in a metal bowl set over a saucepan of barely simmering water using a whisk or handheld electric mixer until tripled in volume, 5 to 8 minutes. Remove bowl from heat. Beat in mascarpone or creamcheese until just combined. Beat double cream/ all-purpose cream in a large bowl; gradually add 4 tablespoons sugar while beating until it holds stiff peaks. Put the chilled coffee mixture in a wide shallow bowl/container. Dipping both sides of each ladyfinger quickly into coffee mixture, line bottom of a 13- by 9- by 3-inch baking pan with 18 ladyfingers in 3 rows, trimming edges to fit if necessary. Spread half of zabaglione-mascarpone filling on top. Grate chocolate over the filling; repeat the layer finishing with the zabaglione-mascarpone filling on top. Chill, covered, at least 6 hours. When ready to serve, dust top with cocoa using a fine sieve and grate more chocolate over, covering surface evenly. *Mascarpone is a sweet and tangy Italian soft and creamy cheese, it's not easily available so I usually substitute 12 ounces (1½ block) cream cheese plus 3 tablespoons cream. 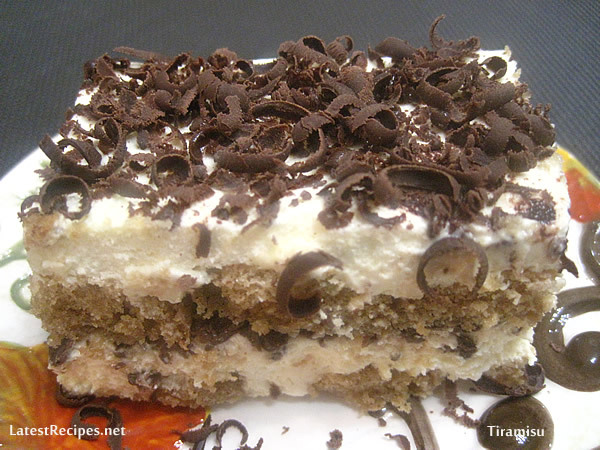 One Response to "♥ Tiramisu!♥"
Also one of my favorites – this is gorgeous – want to just stick my fork in it!